Each year March is dedicated to Women’s History Month and Seaver is celebrating by featuring some of the amazing women in our college, who are extremely successful in their fields. Cheers to celebrating Seaver’s own wonder women! Today, Seaver is pleased to share a Q & A with Director of the Center for Teaching Excellence and Professor of Biology, Martina Ramirez. Q: Please share with us why you wanted to pursue your Ph.D. and work in higher education. 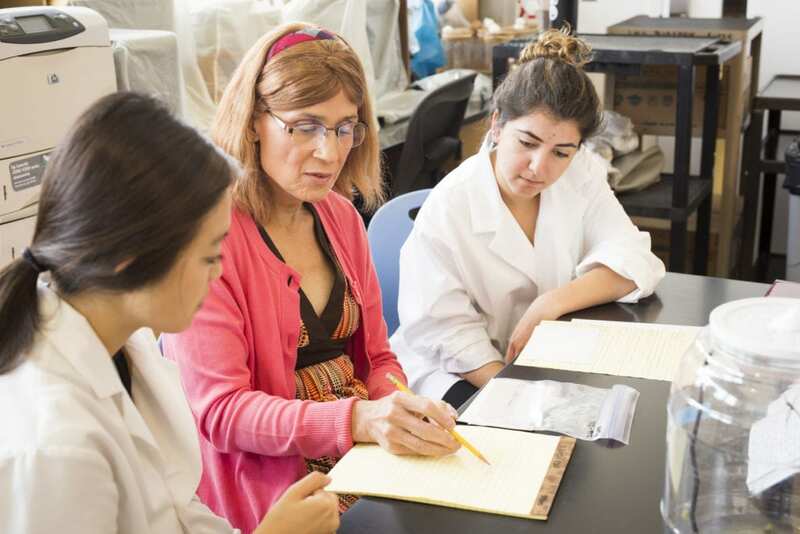 Dr. Martina Ramirez, professor of biology, teaching students. A: During my years as an LMU Bio major (1977-1981), I only had one woman professor, Dr. Jackie Dewar, who taught me Calculus II during my first semester at LMU, fall 1977. During the remainder of my 4 years, I did not have another woman professor for the balance of my courses in the Seaver College, due to the significant under-representation by gender and ethnicity among the Seaver faculty at the time. It was that glaring lack of role models which resulted in my decision to attend the doctoral program in Bio at UC Santa Cruz, since I wanted to become a change agent for STEM diversity as a faculty member, which I have done for 28 years, including 20 at LMU. A: Well, based on my experience as having made it to success in STEM despite being under-represented in multiple ways (gender, ethnicity, first-gen, low income, LGBTQ+), I always tell my students they need to ‘be on their game’ as they progress along the STEM education/training path. I tell them that since they will automatically be thought of as less or not considered ‘worthy’ by some people simply due to who they are, they have to be at least as good if not better than their peers who are not under-represented in STEM. And while this context of a sometimes ‘chilly’ or even hostile atmosphere may make it harder for them to move along toward their goals, I tell them to not give up on their dreams and to be persistent in taking advantage of opportunities which will get them closer to their goals…no matter what! A: My high school public speaking coach, Barbara Busse, had a huge impact on my life and success. From my first year at Damien HS until I graduated in 1977, Barbara helped me perfect my craft of ‘telling story’ and helped me appreciate the power of narrative. I also worked for our high school newspaper for four years, with Barbara as the faculty advisor, and so learned from her the ability to write in a way that conveys good info, but also keep the reader’s interest. Barbara is also the reason I came to LMU, since she was actually a faculty member here in the College of Fine & Communication starting in 1969 and until her retirement in 2015, inc. many years when she served as CFA Dean. Thanks to Barbara bringing me to a public speaking tournament at LMU in fall 1973, my first semester at Damien, I was really taken by its setting on the bluff, as well as its Catholic/Jesuit background. And so it was always my top choice when I was applying to colleges as a senior at Damien.